Sheriff, London and Mdx. Mar. 1393-4. Commr. to make arrests, London Mar., Apr. 1394, Nov. 1407; of gaol delivery Oct. 1397, June 1398; oyer and terminer Sept. 1401 (ransom of the count of Denia), Mar., Apr., Oct. 1403, Nov. 1405 (bis), May 1406, Nov. 1407, June, July 1409, May 1414, Feb. 1416, Dec. 1417, Nov. 1418; to supervise the collection of Peter’s Pence in England Aug. 1409; of inquiry, London Jan. 1412 (liability for taxation), Dec. 1412 (seizure of merchandise), Jan. 1414 (lollards at large), July 1418 (possessions of Sir John Oldcastle*); to administer revenues for building work at Westminster abbey Dec. 1413; recruit carpenters for the same Mar. 1414. C66/347 m. 32v, 349 m. 35v. This biography relies heavily upon C.M. 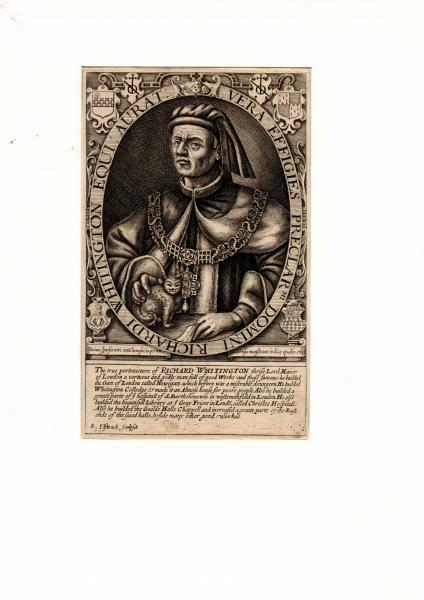 Barron’s detailed study ‘Richard Whittington’, Studies in London Hist. ed. Hollaender and Kellaway, 197-248. Unless otherwise stated, information provided in the text is taken from this article. 1. Barron, 198-9, 223-4; J.H. Wylie, Hen. IV, iii. 165. 2. Cal. Letter Bk. London, H, 239, 270, 281; Cal. P. and M. London, 1381-1412, pp. 85, 123. 3. Beaven, Aldermen, i. 71, 74; CPR, 1396-9, p. 144; Cal. Letter Bk. London, H, 440, 445; Cal. Letter Bk. London, I, 52-53, 60, 226-7, 246. 4. Mercers’ Company Recs. Wardens’ acct. bk. ff. 16v, 34, 47v. 6. Guildhall Lib. London, 2903. 8. 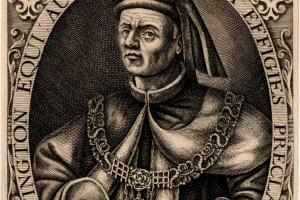 It is not known if Whittington held office continuously throughout this period, since there are no references to him as mayor between April 1409 and July 1413 (Barron, 218, 244). 9. DL28/1/2, f. 6v, 3 ff. 20, 21v, 4 ff. 5, 19v, 20v, 3/2 f. 15; Staffs. RO, D641/1/2/1 m. 4, 4 m. 5, 5 m. 2. 10. Dr. Barron’s figures do not include a sum of 500 marks repaid to Whittington by the receiver-general of the duchy of Lancaster in August 1415 (DL42/17 (pt. 2), f. 29v). 11. For Whittington’s exports from Chichester see E122/34/2, 3. 12. E101/674/26; Staffs. RO, D641/1/2/11; Cal. Scots. Docs. (supp.) v. no. 928. 13. C241/185/6; VCH Glos. xi. 111. 14. C241/185/6; VCH Glos. xi. 111. 15. HMC 7th Rep. 681. 16. C241/209/29; Corporation of London RO, Bridge House rental, f. 59. 17. Corporation of London RO, hcp 137, Monday aft. feast St. Edmund, 14 Hen. IV; Warws. Feet of Fines (Dugdale Soc. xviii), 138. 18. C.M. Barron, ‘Richard II and London’, Reign Ric. II ed. DuBoulay and Barron, 198-9. 19. The Brut (EETS, cxxxvi), 354. 22. Anglo-Norman Letters and Pets. ed. Legge, no. 33. 23. HMC 9th Rep. app. 1, p. 285. 25. Colls. Citizen London (Cam. Soc. n.s. xvii), p. ix. 26. CFR, xiv. 320, 419; J.A.F. Thompson, Later Lollards, 20. 27. Libelle of Englyshe Polyce ed. Warner, 25.